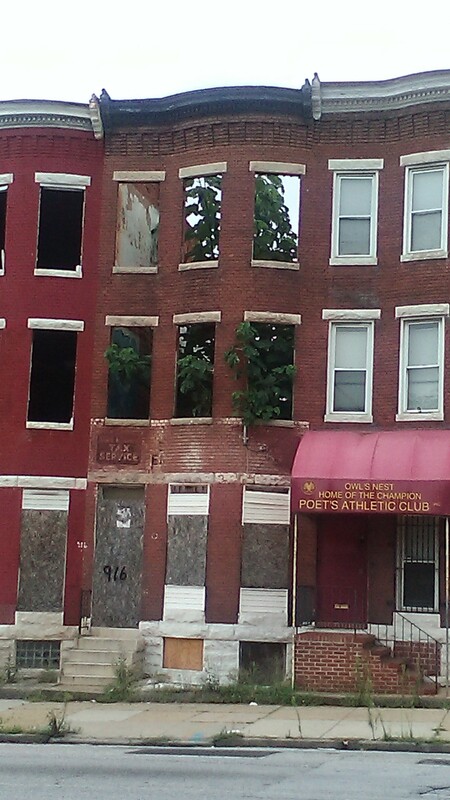 “A Tree Grows in Baltimore,” photo taken by A. Jarrell Hayes. I took this photo somewhere near E. North Ave. I had seen this tree growing through the abandoned house dozens of times. It’s been there for years. Dilapidated, boarded up, forgotten. Yet something still found the strength to grow, big & tall, busting through the plywood and cracked glass despite the circumstances. There’s a connection between that and Baltimore, the city where I reside. Where the citizens are often left to be like that house & that tree — disinvested in by city leaders, forgotten and left on their own. Some, like the tree, find the strength to grow. Many others do not. It’s disappointing that people are forced to make those choices. Especially while they are children — the problems are generations old. Generational poverty doesn’t kick in once the person becomes an adult. It’s there since conception and before. When I first saw this tree, I marveled at its strength and perseverance. After I took the picture and studied it, I felt ashamed. Ashamed that this is a common scene. Society discarding neighborhoods and communities and people until society is able to find a way to profit from them. And if not, society will profit from their pain. Even if they grow to burst through the ceiling. Sadly, the world doesn’t have to be this way. The leaders choose to have it this way, and the masses go along with it. Either because they agree, hoping to play the game long enough to rise to the top, or they are in despair or they’re apathetic. I strive to grow, like that tree, reclaim what has been discarded. Not simply for myself, but for my family and for others. This essay is included in Gratitude: Baltimore.